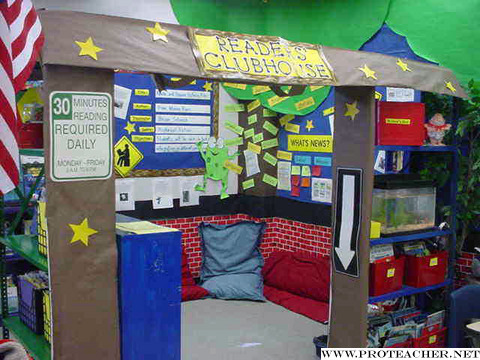 This reading corner was designed to invite students to become part of a grade level reading club. Students wrote pledges detailing how, where and why they like to read and swore an oath pledging to become better readers in the coming year. Students' pledges are displayed on the walls of the clubhouse along with the oath they took. In the clubhouse students can choose books organized by genre and reading level and curl up on the pillows or soft sofas to read alone or with their fellow club members. They post their work, drawings and book reviews on the bulletin boards in the clubhouse and add new vocabulary words learned in reading and writing lessons to the trees growing from the corners of the clubhouse. From inside the clubhouse students have a view of the class pets in the fishtank and are reminded by child-friendly signs that they are required to read for 30 minutes daily. The clubhouse has literally become a favorite place to gather within the classroom.